Imogen's Typewriter. 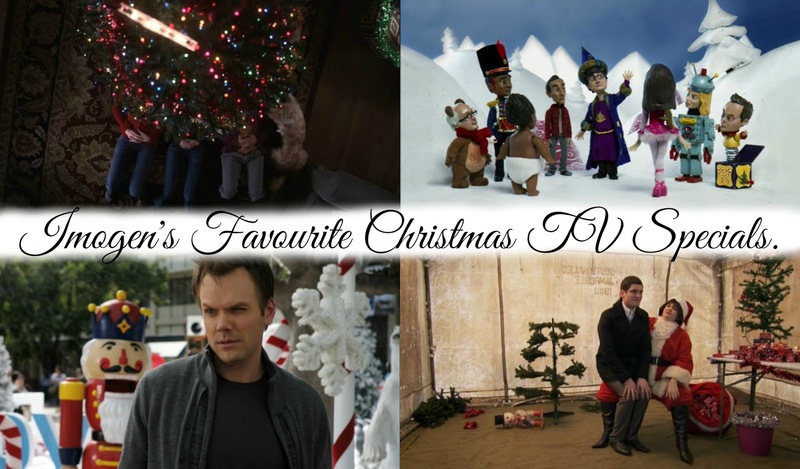 : Blogmas Day 10: Best Christmas TV Specials! I’m a big fan of Christmas, and I’m a big fan of TV. So when TV shows do Christmas episodes I get excited and there are a few which I have playing in the background on a loop when this time of year comes around and I’m getting in the spirit while I bake/ decorate/ wrap/ etc. So I thought I’d put together a list of the best/ my personal favourites for you to hunt down on the internet and watch for yourself if you’re in need of a little holiday cheer, sometimes we all need that extra pick-me-up, am I right? Community do the best stand-alone Christmas specials. I challenge you not to end up singing; “Oh Christmas Troy, Oh Christmas Troy.” After watching this episode. It gets stuck in there for days! And "It's December 10th!" today so all the more reason! Possibly my favourite Christmas TV episode ever made. this is a beautiful tale of searching for the meaning of Christmas, which is something we all struggle with after a certain age. "Abed, how many fingers am I holding up, and more importantly, are they still made of clay?" "Three, and I told you, it's not clay. We're silicone bodies with ball-and-socket armatures." Community's version of Glee. Except not rubbish. And in true Community fashion, it gives you all new Christmas music to sing along to. I personally go around rapping things like; “You mean like a spy, investigating, making it seem like I’m celebrating when actually I’m infiltrating Santa’s operation? YOIP!” -because of it. Gavin and Stacey- Christmas Special. The best. This never gets old. If you decide to watch one of these after this post, make it this one. Not convinced? Watch this! As a Greys Anatomy fan (Only up to about season 7, they lost me at that god awful musical episode and I’m still bitter about the way it went) you can’t go wrong with this vintage episode. Another show that didn’t age well in my opinion, and definitely not an episode to watch with the kids but if you want a few laughs, attractive men, a little bit of horror (the producer wanted to make "the most violent Christmas special in the history of television" and succeeded) and a truly heartwarming episode where the presents are things like shaving foam and they look absolutely thrilled about it- then this is for you. Barney’s songs about Ted’s sister, that is all. This is worth a watch just for them. “You’re like Weird Al Yankovic if he only wrote songs about banging my sister.” Other then that it’s not hugely Christmassy. Don’t bother with any other than these though, How I Met Your Mother doesn’t do Christmas well. I also really like the Fraiser ones (as you can tell from my Christmas Wish List), Friends, and The Big Bang Theory. Phew! That was a lot of TV! Do you like when TV shows do Christmas episodes? What are your favourites? Thanks for my Secret Santa things!